New Delhi: Minister of State for Youth Affairs & Sports (Independent Charge) Col. Rajyavardhan Rathore has said that patriotism and nation building are two sides of a coin and the nation building is the collaborative effort between the government and citizens. 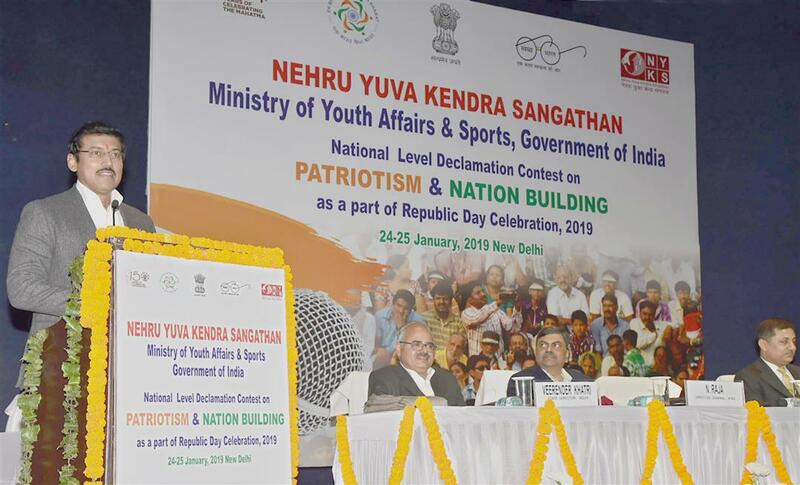 Delivering the inaugural address at two days National Declamation Contest (24th& 25th January) organized by Nehru Yuva Kendra Sangathan (NYKS) with the support of Department of Youth Affairs here today, Col. Rathore stated that every citizen’s contribution is required for nation building. He mentioned that it is a task that cannot be outsourced to anyone. The minister added that India is a country of diversities, and therefore symbols like National Flag and National Anthem are necessary to inculcate feeling of belongingness and patriotism. He reminded that our constitution entitles us to certain rights, but there are duties also which are to be followed by all Indians. The minister also interacted with some of the contestants of the declamation contest from 29 States.